Until now, no data has been available at EU-level on audiovisual authors’ remuneration. 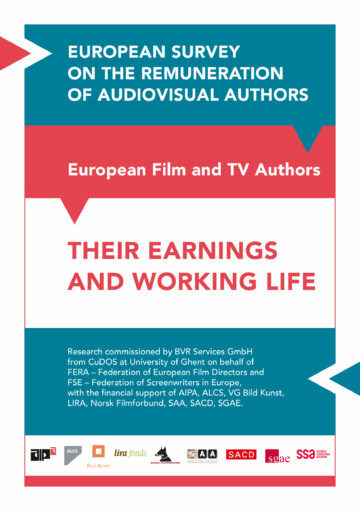 This report presents the results from the first ever, comprehensive, Europe-wide research into the economic and social situation of European audiovisual authors. The survey addresses the members of 57 professional organisations in 26 European countries who are members of the European Federation of Film Directors (FERA) and the Federation of Screenwriters in Europe (FSE) as well as some collective management organisations (CMOs) who are members of the Society of Audiovisual Authors (SAA). Some additional professional organisations for other audiovisual authors were also included. The project was conducted by CuDOS’ team from Ghent University’s Department of Sociology. A little over 30,000 contracts are signed each year for the writing and directing of 11,600 episodes of television fiction and 1,700 feature length films (including 600 feature length documentaries). This copyright material is at the base of an industry that employs more than 1.2 million Europeans and turns over €107.3 billion. Film and television programmes are, on the one hand, the most diverse and on the other the most popular of contemporary arts. Yet often writers and directors raise concerns about job insecurity, instability of income and poorly paid or even free work. FERA, FSE and SAA believe that this profoundly undermines their capacity to do their best work, to make their best contribution to European cultures or to facilitate the economic growth which the European audiovisual industries are so capable of. This study was conducted to provide facts and figures for this ongoing debate. Summary leaflet available to download here. Full report available to download here. Research commissioned by BVR Services GmbH from CuDOS at University of Ghent on behalf of FERA – Federation of European Film Directors and FSE – Federation of Screenwriters in Europe, with the financial support of AIPA, ALCS, VG Bild Kunst, LIRA, Norsk Filmforbund, SAA, SACD, SGAE, SSA.